"I need actually some sales from [the book], only [publicity] it’s been getting is from my name. I need some percentage or something. His people contact my people or something." Drama continues amongst former members of the Boston Celtics. 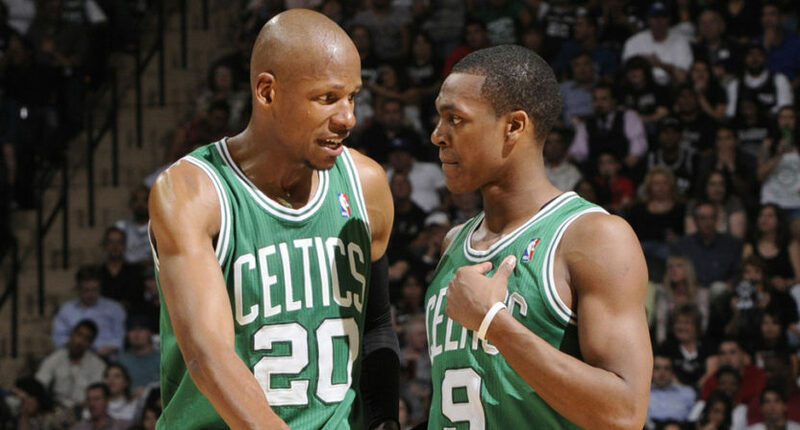 We’ve previously seen many of the guys from the 2008 title team beefing with Ray Allen, including not inviting him to their 10-year celebration, and now Allen has apparently shot back in a new book that particularly complains about Rajon Rondo. Allen recalled that in 2009, because the Celtics’ front office had issues with Rondo, there was talk that Allen and Rondo would be traded to Phoenix for a package built around Amar’e Stoudemire. Allen told Rondo at the time that he should talk to team president Danny Ainge to work out their problems and keep from being traded. …Allen details the famed incident during the Celtics’ playoff series against Miami in 2011, when Rivers was going over film with the team and pointing out some of the errors made during their losses in the first two games. Rondo “put his head down and turned his chair toward the lockers.” Rivers implored him to watch the film. So it’s understandable why Rondo’s upset, as none of that makes him look very good. But it doesn’t seem all that productive for him to go after Allen just for writing a book, or to imply that Allen needs money. And calling for a percentage here seems pretty silly, in jest or not; Allen can presumably write about his own life and his experiences without getting Rondo’s permission or paying him. And those are quite the criticisms from Rondo, especially considering that he doesn’t appear to have moved on from Celtic drama himself. In fact, earlier this year, Rondo got into a fracas with Isaiah Thomas over the Celtics’ planned tribute to Thomas, despite Rondo being on his fourth team since his stint with the Celtics and Thomas being two teams removed from Boston. And that came after Rondo previously threw shade at Thomas through the media. Oh, and this is far from the only drama involving ex-Celtics, as we saw plenty with Paul Pierce going at Thomas earlier this year as well. There seem to still be some big divides between former members of that team, and this is just the latest illustration of that.